THE BAD NEWS keeps coming for Ireland’s print media with a decline in circulation figures recorded for almost every title last year. Fewer people are reading daily and Sunday newspapers, with the latest from the UK-based Audit Bureau of Circulations Island of Ireland data showing nationals have dropped between 2.3% and 9% in circulation since December 2013. The Sunday Independent remains the best-selling newspaper in the country, and the only one breaking the 200,000 threshold. However, it lost just over 10,000 readers throughout 2014. Since changing its distribution time from the afternoon to the morning, The Herald continues to bleed readers. It recorded a drop of 11.8% in the year, falling to 49,512 sales. How many people are still buying every day? How many people are purchasing on Sundays? The Irish Times saw a slight jump in subscriptions for its digital edition with 2,951 people buying the paper online each day. Separate figures from UK circulation analysis outline how a number of other publications were performing at the end-December 2014. All four of the titles seem to have made a recovery in January, with a boost across the board in sales. The Sunday Times, by the end of January this year, was selling an average of 88,072 copies each week after a dip to 81,673 in December. Email “A bad day for Irish newspapers: all of them have lost sales in the past year”. 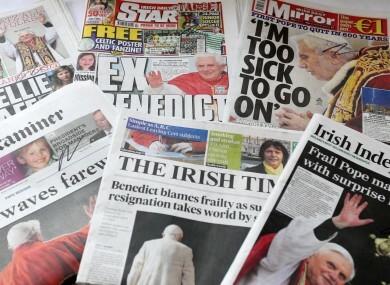 Feedback on “A bad day for Irish newspapers: all of them have lost sales in the past year”.